The approximately 10,000 members of the American Industrial Hygiene Association (AIHA) serve in the occupational and environmental health and safety profession, practicing industrial hygiene in industry, government, labor, academic institutions, and independent organizations, primarily in the United States and Canada. The AIHA is a cognizant authority on all aspects of the profession. AIHA Technical Committees endeavor to ensure that reliable information is provided to all those concerned with the health and safety of people in the workplace and, in some cases, homes. AIHA members often play the unique role of working with other professionals, as risk managers and risk communicators, to solve problems and to protect the health and wellbeing of workers and the general public. 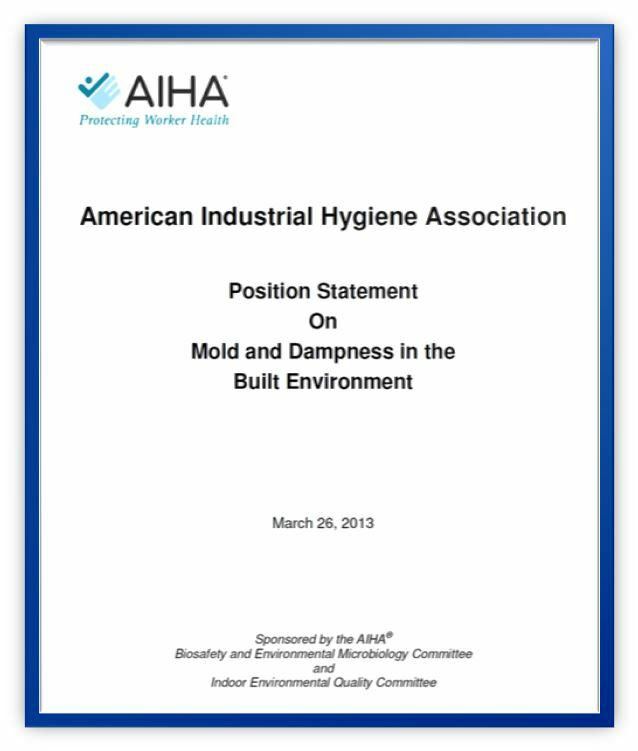 Since 1996, the AIHA has been a leader in the development of information and best practices on the management of mold and dampness problems in the build environment. This information has been relied upon by officials who develop and enforce public policy on indoor environmental quality (IEQ) for the non-industrial workplace, including schools. AIHA has also provided accessible information for individuals to enable more informed choices. It is appropriate to make clear the Association’s positions with respect to reducing the risks associated with indoor microbial growth, and to define and explain the role of AIHA members in such endeavors, to all parties. Modest wetting and drying in buildings and in ventilation systems is normal and generally poses little risk for occupant health. Similarly, very brief episodes of wetting are not usually a problem provided that steps are taken to rapidly dry all materials. (1) “Dampness” is the presence of unwanted and excessive moisture in buildings. (2) This can lead to the growth of mold, fungi, environmental bacteria, and, in homes, house dust mites. Three recent, high quality, systematic reviews of the available evidence concluded that the implementation of interventions that combine elimination of moisture intrusion and leaks and removal of moldy items help to reduce mold exposure and respiratory symptoms and new onset asthma. (4,5,7) This position has also been taken by National Institute for Occupational Safety and Health (NIOSH) and many State governments (8), Health Canada(9,10) and internationally by the World Health Organization(11). Based on this evidence, the position of AIHA is that persistent dampness and mold damage in the non-industrial workplace, including schools and residential housing, requires prevention, management and effective remediation. If visible mold is present, it should be remediated, regardless of what species are present. Such actions are likely to reduce new onset asthma, lead to savings in health care costs, and improve public health. AIHA recognizes that there are a number of audiences for the reports that are provided pursuant to a mold investigation. Regardless of the nature of the client (homeowner, insurance agent, large property company, government), reports must provide information that can (a) be translated into an action plan for repair and rehabilitation of the space, (b) provide a basis for protecting occupants and remediation workers health and, in certain situations (c) be useful for the personal physician and/or public health officials. AIHA recommends that clients verify that the consultant has suitable training and project experience, as well as appropriate and related references. (19) Almost all industrial hygienists (IHs) have college degrees in engineering or the natural sciences, such as biology, chemistry, biochemistry or microbiology. Additionally, 42% have master’s degrees, and 12% have doctoral degrees. Industrial hygienists also have specialized training in ventilation engineering, environmental health, toxicology and microbiology. Unless this is waived by the client, investigators should be independent of the remediation contractor and testing laboratory associated with the project. (16,19,20) Basic competencies that should be assessed by clients include knowledge and education in exposure characterization, microbiological assessment and remediation, general knowledge of the ecology of fungi and bacteria associated with damp or flooded buildings, building science and problem areas in Heating Ventilation and Air-Conditioning systems. (19,20) If samples are collected, laboratory analytical staff should have specific training and experience in the identification of environmental mold and bacteria, and be able to demonstrate successful participation in an external proficiency testing program. (2,21) Some States have certification requirements and other regulations regarding mold-related activities or remediation. A number of Canadian municipalities have regulations that cover mold damage in residences from illegal marijuana grow operations. If mold is suspected, but not visibly detected after a thorough inspection, then microbial air sampling conducted in accordance with guidance documents can be useful. (2,3,24) This sampling may reveal evidence of indoor mold amplification or reservoirs, particularly of mold that is considered “hidden” behind walls and other building structures. If mold is being removed and there is a question about how far the colonization extends, then surface or bulk sampling, in combination with moisture measurements from affected building materials, may be useful. Sampling for airborne mold spores can indicate whether the mix of indoor molds is “typical” of the outdoor mix or, conversely, “atypical” or unusual at the time of sampling. animal and chemical-based allergens already present and/or exacerbated by the water damage. Many potential contaminants may be present along with mold damage that can affect health or the safety of investigators, remediation workers, and occupants. For example, failure to recognize the presence of asbestos, radon, or lead-based paint could lead to their disturbance during investigative or remedial activities, unnecessarily creating a new hazard. Finally, there is a need to recognize the potential hazards associated with remedial alternatives that may lead to the introduction of pesticides, ozone, chlorine dioxide, and other chemicals that could exacerbate existing health conditions or lead to new health issues.